Oh no! It's halfway through the week and the Persuader still hasn't made an appearance. I think we can safely assume it's his handiwork in panel three, though. That doesn't get him off the hook: I want to see me some Persuader, and I want it sooner, not later. Oh god. What if they just sprung the Shocker out of jail and brought him back to the East Coast? There's a scary thought. TIL: Panel three has its charms. I didn't post it yesterday because, in all honesty, I forgot that I posted stuff like this. Also, that Spider-Man is more like Venom, with the teeth and all. I hope the Persuader shows up soon, or we may have to deal with mopey Peter Parker. I pray to God he doesn't spend tomorrow bemoaning Jameson's reaction to the pictures. TIL: Jameson momentarily becoming a hunchback in panel two. Just typical happenings here, which is much better than the whole California thing. However, the above comic makes it appear that there are two doors to Jonah's office, both on the same wall. Unless Jameson moved between panels, but that would only make sense. Over a Month of Backlog? NOT IF I CAN HELP IT. AND I CAN! TIL: Jonah looking shocked in panel three. Robbie Robertson totally knows that Peter is Spider-Man. TIL: Robbie's reaction shot in the final panel. There's nothing better than saying that one of your good friends (and your boss) is the person he loathes most, right? TIL: Jonah's asexual reproduction in panel three. I'm not doing a "Thing I Liked" for today, because there's just so much I like about this particular strip. Well, just two things, really, but considering how it's a three panel strip that's sort of a lot. The first thing is Robbie's reference to the Silver Surfer. This is just preposterous on any level, especially since I have no idea if the Surfer is real or not in this comic strip. If he is, that would just be weird, though it fills me with hope that Simon Krandis might be Galactus. Well, not fill, but it would be an interesting (and totally absurd) twist. The other thing is Peter's entrance in panel three, because it's reminiscent of one of those religious types who go door-to-door trying to convert people. If I ever do an FAQ about this strip, I'm totally using that panel as an intro picture. On the fifteenth, Peter claimed he was coming back because he and his wife needed a break from Hollywood. Unless Jonah has no short-term memory, he should remember this. Also, I just realized that Peter left Jonah's office just to swing in front of it as Spider-Man. If this nonsense continues, Simon Krandis being Galactus won't be that far-fetched. TIL: Jonah's head is about to explode in panel three, it looks like. It's strips like these that make me sort of glad I'm not good at keeping a daily schedule, since I have just about nothing to say about this one. And, considering some of the other nonsense I put up here, that's saying a lot. TIL: Panel one looks sort of silly. I'm actually more interested in this Simon Krandis chap than anything Spider-Man could do right now. Why cut away from it? It's not as if the strip has shied away from going a month or two without any Spider-Man appearances before. TIL: Peter's use of "convinced" as a synonym for "flattered him to the point where he sort of forgot about the whole thing". TIL: The perspective in panel three makes it look as if Spider-Man is a giant. How did those guards get free? For that matter, how did two thugs like that manage to hold up an armored car? Is the law enforcement community of this New York that lazy and/or incompetent? No wonder they need Spider-Man. TIL: I am psyched about the Persuader. Do you think he's gonna be a costumed menace, or just some muscled thug in a sport coat? OR MAYBE BOTH?! I'm considering this a "Spdier-Man in other comic strips" thing, because it's just so gosh-darned wonderful. 10/18: Peter defines himself in the 10/12 strip as a "freelance shutterbug", and according to the Merriam-Webster online dictionary, the definition of freelance is a person who pursues a profession without a long-term commitment to any one employer. They don't get employed, they sell their pictures to whoever they please. So Jonah's threat to send Peter to the unemployment line is also folly, as Peter isn't technically employed. In fact, before this Blog started there was a storyline where Peter tried to get employed by the Daily Bugle to get health insurance. So these past five days were only notable for the introduction of the mysterious "Simon Krandis". TIL: Robbie looks like Frankenstein's monster for some reason. 10/19: The logical conclusion to this, at least for people who have no idea that Peter is Spider-Man, is that Spider-Man either has teleportation skills or is, in fact, an entire brigade of people. The second conclusion is full of holes, however, as no one ever sees more than one or two Spider-Men at a time. TIL: Jameson's reaction shot in panel two. Who Is Simon Krandis? Theory Below! Jameson is pretty much babbling today, isn't he? Nice to know he's finally gone around the bend, but perhaps this will lead into a storyline where it's revealed that Jameson has developed schizophrenia and "Simon Krandis" is just another facet of Jameson himself. Once he realizes this, he will retire to Florida muttering about Spider-Man. Unfortunately, the truth will most likely be just as exciting as all that. TIL: Jameson's attempt at ventriloquism in panel one. This post marks one year of the Amazing Spider-Blog! I'm surprised it's lasted this long, and that people are actually reading it! Also, 275 posts! Woo? Oh, and if you have any ideas about how I can make this Blog better please leave a comment or two with this post. Thanks! Well, it's almost certain Simon Krandis isn't the Kingpin. I only hope he's interesting and we're not stuck with three months of Kordok-like shenanigans. TIL: The fact that this was updated on time. The Big Catch-Up, Week Seven: In Which Spider-Man Finds a Heffalump. Well, it would appear that with this update I am finally caught up. I pray to God that circumstances never let this happen ever again, and I will try my hardest to stay at least a bit updated. Nothing like this, though... never again like this. 10/06: The fourth panel of this comic would feature Stan Lee mugging the camera and saying, "Buy your Amazing Spider-Man costumes at your local 'Toys 'R' Us', True Believers! EXCELSIOR!" TIL: I'm going to cheat a bit here and say nothing really stood out enough for me to like it. I thought this had been resolved yesterday. Also, why is his spider-sense going off? There's no danger about. I think poor ol' Stan Lee needs a bit of a break. TIL: The X-Men reference. It's stupid, but in a charming way. We all know that planes are the last bastion of privacy, so it's no wonder Peter and Mary Jane are talking about their respective secret lives. They're being remarkably subtle about it, though, so that's good. TIL: Peter using Mary Jane as an armrest in panel one. You'd think it would be a relief for the usually money-starved Parkers to come back to their modest New York apartment and realize that, thanks to Mary Jane's paycheck for "Marvella", they won't have to worry about rent and that sort of thing for a while. Instead, they simply bemoan their situation. I'm beginning to dislike the Parkers. TIL: Peter's tiny tiny head in panel two. Peter earns some likability points as he expresses displeasure at the thought of leaving the city which has been his home for the better part of thirty years. I like that they're back in New York. It just feels sort of right. I can't shake the feeling that, back in Los Angeles, some c-list villain is setting himself up to be disappointed. He won't be that much trouble, and easily defeated by local law enforcement (with minor aid from the Land Captain), but he'll be wishing he could fight Spider-Man. Poor guy. It's the return of nightgown Mary Jane! Long-time readers may remember that, for several weeks, Mary Jane paraded around in that nightgown. (It's here.) It looks like that won't be repeated here, though, as Mary Jane quickly throws on some actual clothes. Peter remains shirtless, however, presumably for the ladies? TIL: The promise of Robbie Robertson. Hooray! That was quick. I was half-expecting Peter to traipse around New York for a month before even laying eyes on the Daily Bugle, and another two weeks until he made it to the offices of the Daily Bugle. Thank God this was not the case. TIL: The fulfillment of the promise of Robbie Robertson. They'll be in for a rude surprise when Spider-Man is back. No one will put two and two together, though. It's not like Robbie doesn't already know Peter is Spider-Man, though. I do have to wonder why Jameson is back, as I was looking forward to some time without Jameson. At least Maria didn't follow him. TIL: That Maria did not follow Jameson and we're rid of her. I wonder what JJJ's secret mission is. I also wonder why he looks like a mutated chipmunk in the middle panel. TIL: The fact that Jameson is a jerk. Wait, I don't like that. I hope to God it's the Kingpin. This is something the Kingpin would do, buying out the Daily Bugle. OH GOD I HOPE IT'S THE KINGPIN! With that, folks, we're caught up! Just in time for our one-year anniversary, which is kind of a redundant term! Tune in tomorrow for... well, more of the same. Fred Hembeck has a big ol' book coming out, and I rather like the guy, so you should take a look at it. It also has a foreword by Stan Lee, who writes the "Amazing Spider-Man" comic strip, so there's your thematic link. The Big Catch-Up, Week Six: The End of the Amazing Spider-Blog?! After being unable to use a computer for several days (due to work and other commitments) I logged on to the Houston Chronicle site. As many of you know (knowledge that is now spread to all) I read "Amazing Spider-Man" on that wonderful web site. This is because that site carries it in color, and I am usually unable to find it in my paper. It's not with the other comics, for some reason. Instead, it's banished to some back page of the Classifieds with "Judge Parker" like some sort of leper. In any case, I logged on and found that none of their color comics were loading. I'm sure this is just a temporary snafu, but just in case... anyone know where I can read "Amazing Spider-Man" online? 09/29: I thought they were already teamed-up. TIL: The use of the term "team-up". Neither one of them knows how to pack a blasted suitcase, apparently. TIL: That blond guy in the first panel in the middle row. One could equate Mary Jane's star power as being "great power", one which she has a duty to use responsibly. Here we see her abusing her power, and her husband happily agreeing that this abuse of power is aces. While using her power to get a quicker plane ride home is pretty mild compared to some things celebrities have gotten away with, it's still not very nice or anything. They've packed their suitcase properly, at least. Also, she's not even a movie star yet. Her movie hasn't even come out yet. TIL: That weird painting in the second panel. Yes, because we all know using his superpowers to make his life easier is what Peter Parker is all about. TIL: The fact that Los Angeles apparently has ten-lane highways. I could see this working out if Spider-Man was web-slinging or something, but he's jumping on top of cars. Everyone in Los Angeles is seemingly after his pot o' gold - er, secret identity, and his wife is beset by autograph hounds at every turn. This is a very meandering post, but what I'm trying to say is that this is like the second least smartest thing he could do right now. The least smartest would be to do it without his costume on. TIL: I guess the cab driver's shirt. So that's why he's not web-slinging. Thanks for letting us know, comic. TIL: HA HA VOMIT REFERENCE HA HA HA! Actually, that's the thing I like least about this comic. Ha ha, it's another reference to Superman. Also, a joke about airport security! Okay, seriously, just let them get back on the blasted plane and get back to New York. Let something spider-intensive happen, please, I'm getting bored. TIL: It looks kind of like Mary Jane is saying, "Oh mooo!" in the third panel. God, am I tired. Well, it's Wednesday. I had no idea it was Wednesday until about an hour ago when I went to read my daily allotment of web-comics and discovered the ones that update on Thursday weren't updated, but the ones that update on Wednesday were updated. Boy howdy, was I surprised! 09/22: It's times like this that I'm glad I slacked off and didn't update for a month and a half, because I have absolutely nothing to say about this strip and such a thing looks better in a compilation then a single post. TIL: It's kind of funny how the Shocker is upside down. Thank you for explaining why Shocker didn't just bust out. That is very kind of you. Though I find it hard to believe that Jameson forgot Maria was there. TIL: How SHOCKED the Shocker looks in the sixth panel. Next up on whatever the heck their show is called: How the Shocker caused a massive earthquake killing thousands, and then afterwards kicked a blind puppy! STORY AT ELEVEN! TIL: Spider-Man's shattering of the fourth wall. Larry Lieber, after recently figuring out how Spider-Man is web-slinging around California, is going to milk it for all it's worth. I have no problems with this. TIL: The convenient placement of palm trees. Oh dears, sadness abounds for Mary Jane. 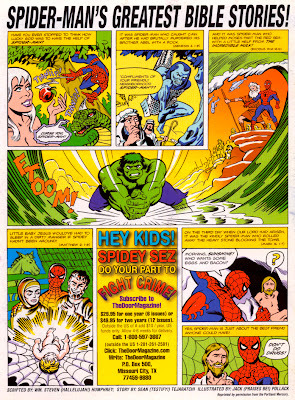 It looks like Peter is in the jungle in panel one. Will he meet the Phantom? First thing, I think I mentioned something about how foolish it was that the studio was blindly making a "Marvella" sequel some time ago. It's good to see they've come to their senses before committing themselves to something that may be a disaster. Second, whoever organized that contract is the worst agent in history. Not only will Mary Jane get typecast as Marvella and therefore potentially damn her career, but by the time the second Marvella movie comes out (if ever) no one will remember Mary Jane Watson-Parker. "Sorry your movie career has been killed before it was able to begin, but at least I beat up a super-villain!" That's like a postman coming home from work and telling his wife (who is a an aspiring baker) "Sorry your cake didn't win the bake off, but at least I delivered some mail!" While doing your job is something to be proud of, don't try to use it to cheer people up. Unless you're a clown or comedian, in which case knock yourself out. TIL: The amazing shape-shifting television, as well as the magical shadow-casting signature box. My goal is to be caught-up by Friday, and barring that, October 16th. I have everything set up, and all I need to do is lay down some commentary on those bad boys and post 'em up. The Big Catch-Up, Week Four: Questions Abound? As we approach the anniversary of the creation of this Blog (willickers!) another week of strips is commented upon! Will the backlog be complete in time for the anniversary? Is anyone still reading this? The answers and more eventually?! 09/15: I would like this more if we focused on the battle between super-people and ignored the misadventures of Jonah and Maria. I'm surprised the Shocker is still holding the bag, and wonder if he will still be holding it when he's inevitably caught. TIL: The "ZRRAKT!" sound effect. 09/16: I am so glad they wasted a Sunday strip with Jonah and Maria. 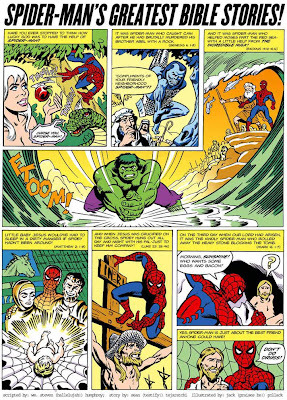 The Sunday strips are nearly always better-looking than the weekday ones, and Alex Saviuk (supposed artist of the Sunday strips) is a man who can draw a pleasing Spider-Man battle. I mean, look at the first and last actual panels in this one. Instead, we get Jonah and Maria flirting. THANKS A LOT. TIL: As mentioned above, I find the first (er, first actual story panel) and last ones particularly pleasing. Larry Lieber is also a man who supposedly knows his way around Spider-Man and his fights. Why, then, is his work not as visually dynamic as Saviuk's? The answer for this is probably that the man was born in 1931, currently making him seventy-six years old. Seventy-six years old, and they expect him to draw a daily comic strip. That is six comic strips a week, for fifty-two weeks a year. That's three-hundred and twelve strips. Factor in the fact that each strip has three panels (for the sake of argument, we'll call it 2.5 panels) and the man draws 780 panels a year of this comic strip. Now if this was "Peanuts" or something, that wouldn't be so bad, since the characters in most other strips are stylized to make them a bit easier to draw. Mister Lieber does not have that crutch. He has to draw somewhat realistic people in little boxes somewhere around 780 times over a given year. And, in some of those, he has to draw Spider-Man or the Shocker or Doctor Octopus. In fact, forget the others. He has to sometimes draw Spider-Man. Look at Spider-Man up there, with all those webs on his costume and whatnot. Larry Lieber has to probably draw those webs, on a deadline, about three hundred times a year. More so, he has to draw them accurately. TIL: The "FROK" sound effect. I was wondering how the Shocker would be able to actually hurt Spider-Man with a punch. On another note, there's an email address hovering there between the second and third panels. I can't make out what it says, and my image editing program is being of little help. I can see it's "@aol", though. Can anyone make it out? 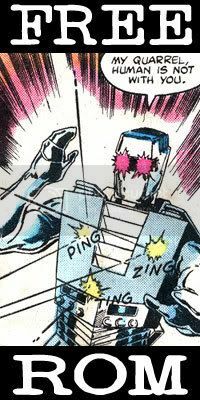 TIL: The fact that, supposedly, Larry Lieber agreed to draw Spider-Man's webs and Shocker's quilty costume for several weeks. At least, I hope he agreed to it. I would hate to find out that Stan Lee was just kind of like, "You have to draw Spider-Man and the Shocker for a bit." Which is kind of extra terrible, because Larry is Stan's brother. No joke. Years later, Jonah would tell this story a bit differently. In his version, he intentionally threw himself into the Shocker's blast to save Spider-Man's life. Also, Jameson had better hair and a better physique, and Spider-Man let out a cry of anguish upon seeing "his personal hero" (Jameson's words) go down in the heat of battle. This supposedly gave Spider-Man the strength to beat "the monster who had scared him into hiding". Oh, and the Shocker had caused a massive earthquake which killed thousands and kicked a blind puppy. TIL: The sound effect "SZZRAK". Way to point out the obvious, Spider-Man. That blast obviously hit Jameson in the elbow. Unless he has some sort of weird anatomical thing where his elbow houses an important or sensitive organ, there is no reason he should be down for the count like that. Yes, I know getting hit in the elbow hurts a bit, but I doubt it would hurt that much. TIL: The way the signature box casts a shadow. Spider-Man just pimp-slapped the Shocker, as you can no doubt see. Wasn't the Shocker mocking Spider-Man's webbing as being puny earlier, though? Yes, he was, in the first comic of this update. I'm guessing Mister Lieber put his foot down on drawing both of these guys for so long. TIL: Shocker's head being engulfed in yellow flames.